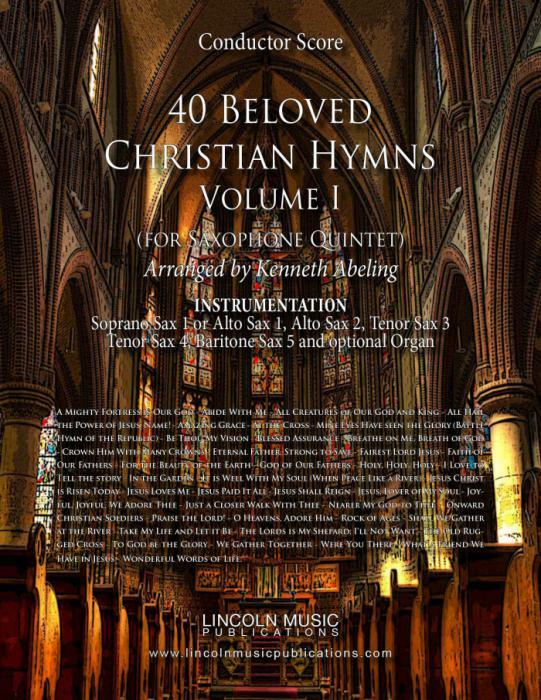 40 Beloved Christian Hymns Volume I for Saxophone Quintet is the first collection of traditionally scored, and frequently used hymns in many Christian worship services. This collection has been completely revised and now includes an optional Organ/Piano/Harpsichord part. The Titles include: A Mighty Fortress is Our God - Abide With Me - All Creatures of Our God and King - All Hail the Power of Jesus' Name! - Amazing Grace - At the Cross Mine Eyes Have seen the Glory (Battle Hymn of the Republic) - Be Thou My Vision Blessed Assurance Breathe on Me, Breath of God - Crown Him With Many Crowns - Eternal Father, Strong to Save - Fairest Lord Jesus - Faith of Our Fathers - For the Beauty of the Earth - God of Our Fathers - Holy, Holy, Holy - I Love to Tell the story - In the Garden - It is Well With My Soul (When Peace Like a River) - Jesus Christ is Risen Today - Jesus Loves Me - Jesus Paid It All - Jesus Shall Reign - Jesus, Lover of My Soul - Joyful, Joyful, We Adore Thee - Just a Closer Walk With Thee - Nearer My God to Thee - Onward Christian Soldiers - Praise the Lord! - O Heavens, Adore Him - Rock of Ages - Shall We Gather at the River - Take My Life and Let it Be - The Lords is My Shepard, I'll Not Want - The Old Rugged Cross - To God be the Glory - We Gather Together - Were You There - What a Friend We Have in Jesus - Wonderful Words of Life.